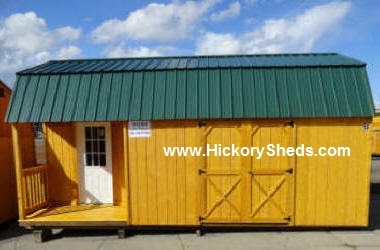 With three factories in Oregon, Old Hickory can easily deliver an Utility Shed, Lofted Barn, Barn, Cabin, Playhouse, Side Porch, Deluxe Porch or Garage directly to your Oregon Home or Business and it's really easy ... all online ... Just email us with your name and the delivery address and we'll email you and 8-page color eBrochure with the styles, sizes, options and prices to Buy or Rent-To-Own and the cost to deliver if any. 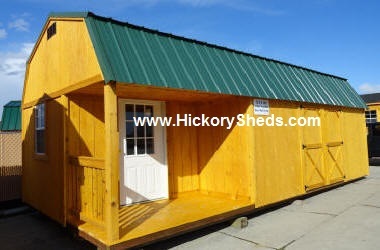 delivery address to pat@hickorysheds.com or call 503-991-8932 7 days a week ... Thanks! Three snow loads are available 40 PSF, 60 PSF and 140 PSF along with engineered plans. The Side Porch is stylish and practical and can be added to the Utility or Lofted Barn. It is available in 12" and 14' widths. Features for all Side Porch buildings include a 36" 9-lite door, 2-2'x3' windows, and a 4x8 foot side front porch. Lofted Barn with the Side Porch coming home ! All text and all digital material contained herein are trademarks and property of MotWick, LLC. All Rights Reserved.